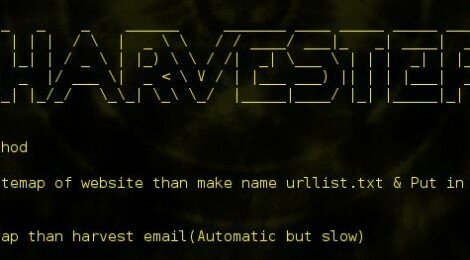 Browse: Home / Eharvester is simple script which extracts email address from the given domain for penetration testing process. + In first mode you have to specify sitemap of website ,it is fast.Just visit this URL http://www.xml-sitemaps.com/ & make sitemap of victim website ;download text file of urllist.txt & put it in same directory of script.Now it crawl one by one url from urllist.txt & collect email address. + Second mode is automatic ; just supply domain name ; it make sitemap & then gather email address.But it is slow . With help of esender you can send social engineering emails to all address which are gathered from eharveter. Enter message. If you want tot send HTML message enter HTML code start with <html>"
sendEmail -f $address -t $f1 -u "$subject" -m "$msg" -s smtp.gmail.com:587 -xu "$address" -xp "$passsword"
#E-Harvester is simple script to harvest email address for penetration testing. #In first mode you have to create sitemap manually. You can use (http://www.xml-sitemaps.com/) to create sitemap. #Second mode is automatic just specify domain name & it will first crawl website ;then harvest email address ;But it`s slow due to crawling process. Script is workng,Please be Patient & give some time to harvest it. Harvesting is complete.Open output.txt file to view email address. Now we have to make urllist of website.So be Patient & give some time to harvest it. wget --spider --recursive --no-verbose --output-file=wgetlog.txt "$choice"
Harvesting is complete. Open output.txt file to view email address. ← hydra – Penetration testing tool.